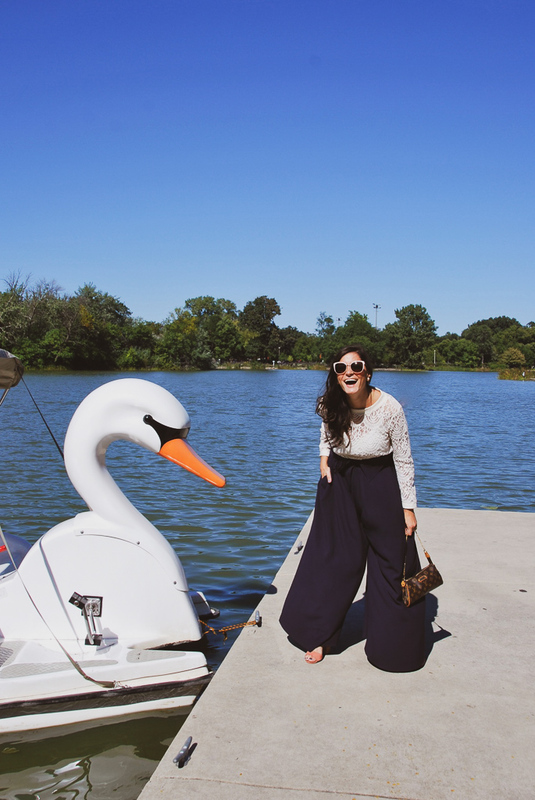 I stumbled upon Swan Lake a few weeks ago and I can’t believe we have these swans in Chicago! I was just randomly passing by when my sister and I saw them. We wanted to rent one, but we didn’t have enough time that day. We for sure still want to go on them so I put them on my list of things to do when we have time! Never would I have guessed that of all the places, Humboldt Park had this hidden gem and pretty lake. There were so many lily pads and beautiful flowers that it didn’t seem we were in Chicago, but I felt like I was back at Giverny, Claude Monet’s Garden. It was just so pretty, peaceful and delicate -kind of reminded me of my outfit. 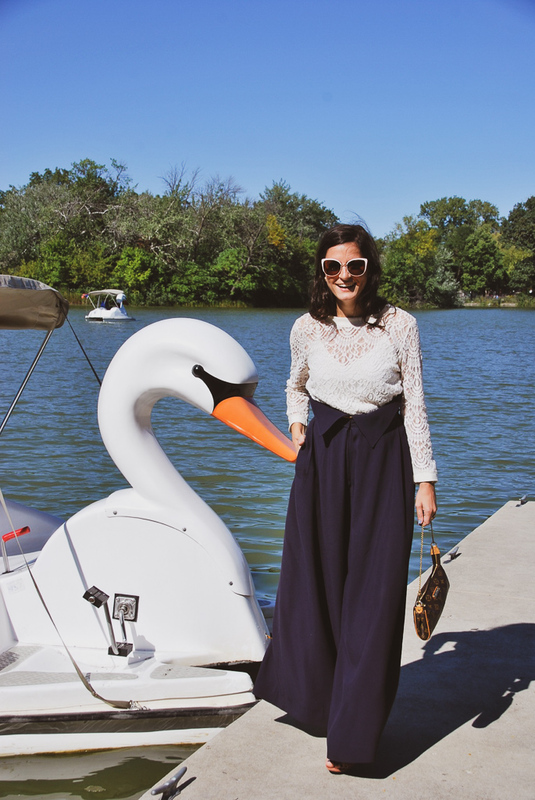 I love lace because it is so delicate and feminine, but I loved the contrast of the power high waisted wide leg pants. This was definitely a feel good outfit. I’m always in the best headspace when I’m wearing something I feel good in. I’ve never actually worn this outfit before and sometimes the best outfits come from experimenting. I didn’t want to get “lost” in my outfit because of my pants, but wearing them with heels gave me the extra height the outfit needed. This turned out to be a great outfit experiment. This morning, there was frost on my car window! I’m hoping I can still wear this outfit with a sweater and some closed toe shoes. I think it’s also time to bring out all of my jackets this weekend. What is everyone up to this weekend?